"If they don't finish the job, their fathers will finish them." 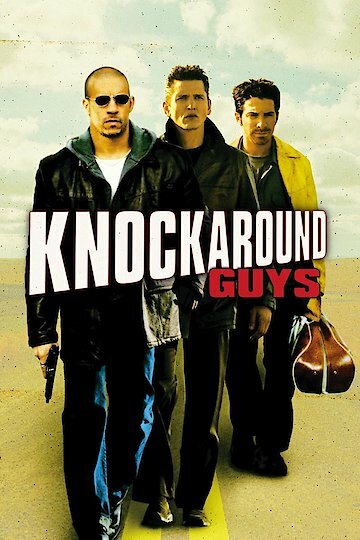 Knockaround Guys was released in 2001, it was written and directed by Brian Koppelman and David Levien. Rated R and with a run time of 1 hour and 32 minutes it starred Barry Pepper, Seth Green, Vin Diesel, John Malkovitch and Dennis Hopper. Knockaround Guys centers around Matty Demaret, the son of a big time mafia boss. Matty and his friend Chris dream of being big time mobsters but are nothing but errand boys. Matty bothers his dad until one day he is given a real job. Matty is to be sent to pick up a bag of money. His father sends along one of his most trusted henchmen, Teddy, to make sure everything goes according to plan. Matty and Chris take along Johnny, another one of their friends, to fly them to their destination and back. Everything is going according to the plan, the money has been safely picked up and they are flying back home. Johnny decides he needs to make a stop in a small Montana town to fuel his plane. Trying to be responsible Johnny takes the money with him when he leaves the plane. Through a series of unfortunate accidents Johnny believes the money was loaded in with the luggage on an airliner. Matty is upset but knows this has to be fixed if he ever wants to do serious work for his dad. As the group sets about trying to find the money in the small Montana town, they manage to attract the suspicion of two local deputies. The officers find out about the missing bag of money and want to find and keep it for themselves. Matty finds out the officers have found the money and when they refuse to give it to him, more muscle is called in. The muscle comes to town looking for the boys but find only Johnny, when questioning him abut the whereabouts of the others one of the men shoots him. Knockaround Guys is currently available to watch and stream, download, buy on demand at Starz, Amazon, Vudu, Google Play, FandangoNow, iTunes, YouTube VOD online.